Słubfurt is the capital of NOWA AMERIKA. An appointment is made between a performer and a spectator: a certain time and place, nothing more. When they meet a rule is set. The performer: “I am going to take you by the hand and ask you to close your eyes.” The couple viewer/performer starts their walk. The performer chooses a focal point and turns the spectator’s head in the right direction so he can perceive it. Aiming the spectator’s head, the performer says ‘open‘. The opening time corresponds to the opening of a camera diaphragm: long enough ‘for the picture to be taken’ “Open, close” will be the only words spoken during the walk. Through this mechanism, everything which enters the field of vision creates an event: it appears to the eyes as for the first time. The discontinuity gives each image the sudden strangeness of a flash. The space is made alive for the eyes. The performer, who is now a guide, must create a relationship of mutual sensitivity so that the viewer can abandon himself ‘into his eyes ’ and accept to be disoriented. The guide’s hands put him in a state of dance. His perception of all his inside movements is highlighted: he dances. It is a duet who is in process through the eye walk: two bodies commit to one another in a simultaneous walk, ‘just to see’. The eye walk becomes a singular way to create a movie out of reality, a movie in which the viewer participates with all his senses involved. Watch out for The Eye Walk in Paris on 11.11.2011 ! We invited artists to present ideas for projects. Deadline was September 30, 2010. Many thanks to all artists for their submissions. The project selection will happen soon, in October 2010. Exchange Radical Moments! 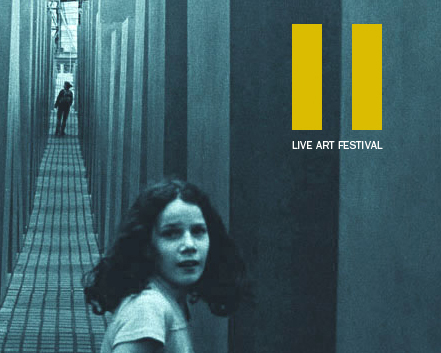 is a brand new Europe-wide Live Art festival. It will take place simultaneously in cities across Europe on 11 November 2011 (11.11.11). The various events will consist of site-specific interventions, public interventions, performances and live acts. This will be the first time that such a festival takes place simultaneously across the European continent. The project is organised and developed by DIE FABRIKANTEN, an arts-based collective from Linz, Austria. Co-organizers are from Italy, Czech Republic, Austria, Macedonia and Germany, associated partners from Moldava, Latvia, Germany and England.